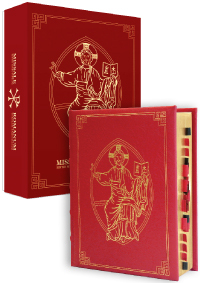 This Chapel Edition of Missale Romanum, Editio iuxta typicam tertiam emendatam, has been designed for daily celebration of the Mass, ensuring that every element is durable and practical while maintaining a dignified, beautiful appearance that is worthy of divine worship. Bound in a durable synthetic leather cover bearing the gold-stamped image of Christ Pantocrator on the front and the Chi-Rho on the back. Smyth-sewn binding and robust end sheets. 1204 pages, measuring 6.7” x 9.1”, on 50-pound paper so it is both light and durable. The font size for Prayers (black text) is 12 pt while the font size for the Rubrics (red text) is 10.5 pt. 29 paintings reproduced in full color from the Church’s treasury of fine art that adorn the seasons and principal feasts of the liturgical year. Six place-holder ribbons in liturgical colors. Gilded edges and gold-stamped tabs attached firmly to the pages. A Latin-language altar missal in a chapel-size edition. Includes (1) the complete text of Missale Romanum, Editio typicam tertiam, (2) the emendations of the 2008 Supplementum: Excerptum ex editione typica tertia emendata (additional options for the dismissal at the end of Mass, prayers for the Vigil of Pentecost, etc. ), and (3) the corrections from the August 2008 Notitiae (minor textual corrections to existing editions) and other minor textual corrections through 2015. All the saints on the General Roman Calendar, including St. John XXIII and St. John Paul II. Permission to produce this missal granted by the Congregation for Divine Worship and the Discipline of the Sacraments, which deemed it to be in accordance with the 2002 Editio typica tertia, the 2008 Emendata, and their sources.